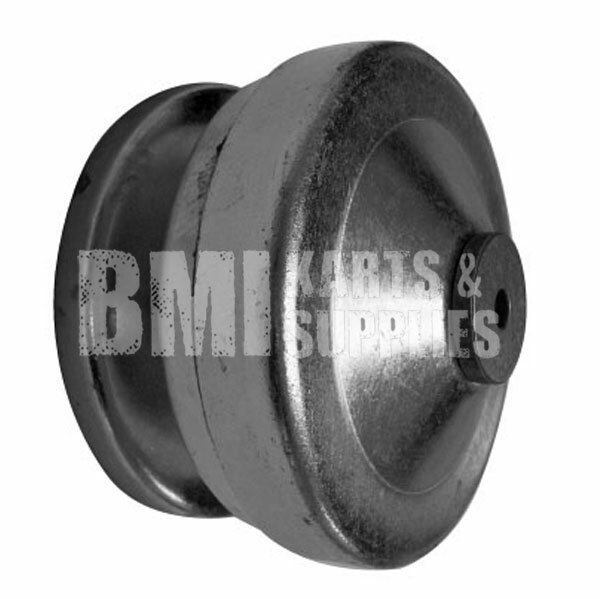 This driver is equipped with a 3/4" bore and 3/16" keyway and requires a symmetrical belt. The drive clutch is composed of heavy walled stamped steel to withstand the extreme rigors of rough applications. Your variable speed drive system consists of a driver, a driven and a 26 degree symmetric V type belt. The driver unit consists of two 13 degree variable pitch sheaves mounted on the engine crankshaft. As the RPMs increase above the idle speed of 1850 RPM the unit is activated by centrifugal force. The floating sheave of the driver is forced inward as the RPMs increase. Contact is made with the belt forcing it to move upward on the driver sheaves and downward on the driven sheaves. The driven unit is two 13 degree variable pitch sheaves with 7 inch diameters that are mounted on the jackshaft. The driven unit has been designed to float on the jackshaft. It should not be fixed. Once the belt is aligned with the driver, all float with the driver will be towards the engine. At Idle Speed- The driver unit is disengaged. No tension on the belt. The driver is immobile. Your complete unit must be mounted on parallel shafts with a desired center distance no greater than 6 13/16 (6.8125) inches. After it is centered at idle the driven unit must have at least 3/8 of an inch inward float to properly align with the driver unit. DO NOT USE UNIT WITHOUT COVERGUARD IN PLACE. Pieces may not be interchanged with any non Maxtorque components. Maintenance will include proper cleaning and lubrication of the driver and driven bushings. This should be performed at least semi-annually. Weekly inspections of the three wear plugs is recommended before damage occurs to the driven unit (larger pulley). Replacement of the wear plugs can prevent costly overhaul of the driven unit. To properly lubricate the driver unit, it must be cleaned first. After dis-assembly, just wipe out excess dirt with a clean rag. After the driver unit has been cleaned, apply Max-Torque's dry lubrication to the angled lop of the weights, the four lobes of the spline, and the hub of the sheave where the bushing rides. Wipe any excess lubrication off the sheaves. Clean the driven unit at the same time you clean the driver. Use the same dry lubricant on the driven unit, the bushing, the spring, the ramps, and wear plugs. When placing the driven unit back on the jackshaft, only use the 2.7" key provided. Upon cleaning the driven unit, if the wear plugs appear worn or missing, they must be replaced. Failure to do this will result in the cam unwinding the spring. Keep the belt dry when running. Do NOT get oil or lubrication on the belt or the in-side of the sheaves where belt contact is made or excess slip will occur. Oil/lubrication must be cleaned off prior to using your kart or you will destroy the belt. Only use the belt provided, it has been designed to open the driven unit sheaves to the proper dimension for the highest speed range. 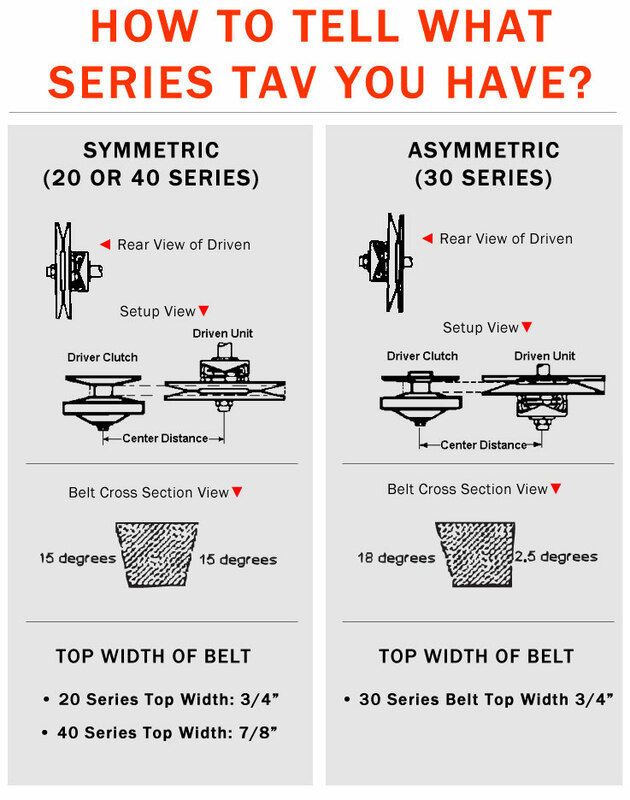 If your belt shows signs of uneven wear, it may be due to the engine crankshaft and jackshaft not being aligned perfectly parallel. -Your variable speed drive system should be mounted on parallel shafts - the driver on the engine crankshaft parallel to the driven on the jackshaft. In idle, the belt should be straight in the sheaves and square to the crankshaft and jackshaft. DO NOT FLOAT the driver unit on the crankshaft. Only the driven unit floats on the jackshaft to align with the driver clutch as it attains the various speed ratios. The sprocket mounted on the jackshaft must be aligned parallel with the rear sprocket. Misalignment can cause damage to the chain. The driver unit must always be in neutral to move in reverse. Any backwards movement while your Variable Speed Drive System is engaged may cause damage, such as unwinding the spring in the driven unit, breaking the wear plugs or damaging the cams. This problem is not covered under The Max-Torque Factory Warranty.